We are providing a comprehensive assortment of Rotary Double Cone Vacuum Dryer, fabricated from high grade of raw materials. Our range of Rotary Double Cone Vacuum Dryer is an ideal instrument of mixing and drying of crystalline products, pharmaceutical materials, insecticides, food products, pesticides and many more. It is also suitable for mixing heat sensitive products. RCVD is suitable for drying mixing powder (raw materials), pharmaceutical materials, crystalline products, insecticides, pesticides, food products also for heat sensitive products. The equipment can also be used as the rotary evaporator. A raw material is charged in batches is subjected to indirect heating while at the same time undergoing rotary motion of the cone assembly. The conical shape of the dryer ensures ef client circulation of hot liquid heating media. Drying takes place when heat flows from outer cone through jacket, and vacuum is applied in the inner cone. The drying operation is based on the principle that water or other volatile product moves from a zone of low pressure. This is accomplished by warming the product to be dried to raise the vapor pressure of the zone of low pressure. This is accomplished by warming the product to be dried to raise the vapor pressure of the absorbed or free liquid, by vacuum, or by sweeping it away with an air current. Thus the essential conditions for effective drying are ef client and uniform heat transfer throughout the batch and rapid removal of the vapor. PROMASTM Rotary Double Cone Vacuum Dryer is unique in removing complete water, or another solvent from wet powders coming from a filtration unit or a centrifuge. 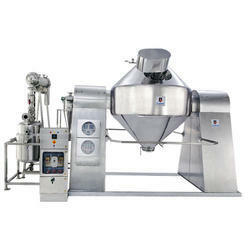 lt can be used as an effective dryer, fast mixer blender or homogenizer. 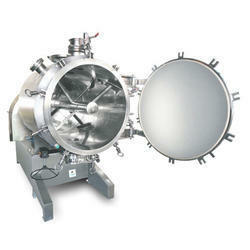 It can also be used as a granulator. The drying time is substantially reduced because of high-speed choppers, which help the evaporation of the solvent or moistures. Chopper speed can be controlled by a frequency drive. Dryer is manufactured as per “US-FDA" Standards Regulations. Low temperature drying under vacuum. Highly efficient for uniform drying in a short time as co-efficient of thermal transmission is high. Solvent recovery can be carried out. Specially designed micro air-filter can be provided on the receiver while breaking vacuum for safe operation. Nitrogen purging system is available optionally for mechanical seal as well as for cleaning the filter. Specially designed S.S. Rotary union is provided for hot water or steam at inlet-outlet. Mode of heating is indirect through steam / hot water or hot oil. A self-cleaning butterfly discharge valve with safety blind cover. Internal cartridge filter for fine powders with the effective surface area. Available in STD/GMP/cGMP/GAMP/GLPI GCP/Lab Models and kilo lab models. The entire drying chamber is well machined to bring about a close encounter with the agitator blade thus ensuring proper shuffling of the material and thus avoiding localized over heating. The leak-proof front opening door ensures easy cleaning of the entire chamber. The top loading and bottom unloading facility provides for easy charging and discharging of the material. The cyclonic trap prevents the fine dust of the dry material from flying into the vapor condenser. The condenser and the condensate collection tank prevent the vapors from entering the vacuum pump. Appropriate vacuum pump and accessories are provided with the unit with valves to adjust the right vacuum in the unit. The entire unit is mounted on a steel frame. They are used with particular success in agglomeration free rapid drying, heterogeneous reactions with systems of different substances, sterilization and in general for vacuum application. The heating arrangement can also be provided along with the unit. Choice of product contact materials: AISI 304L, AISI 316L, Hastelloy optional HALAR/PTFE Coating available.Volume of the wet material loaded into the dryer is restricted to 40-45 % of gross volume. Looking for Rotary Double Cone Vacuum Dryer ?